On display until September, the Museo del Prado and the Fundación Amigos del Museo del Prado are presenting the last work by the Iranian artist Farideh Lashai (Rasht, 1944 – Teheran, 2013), When I count, there are only you…but when I look, there is only a shadow (2012-13), a video installation inspired by Goya’s Disasters of War. Farideh removed the figures and modified the images in this iconic print series in order to present them accompanied by animated images which are projected onto them from a moving spotlight. This presentation offers a unique occasion to see Lashai’s work located alongside the prints by Goya that inspired them and between his Black Paintings and The 3rd of May. 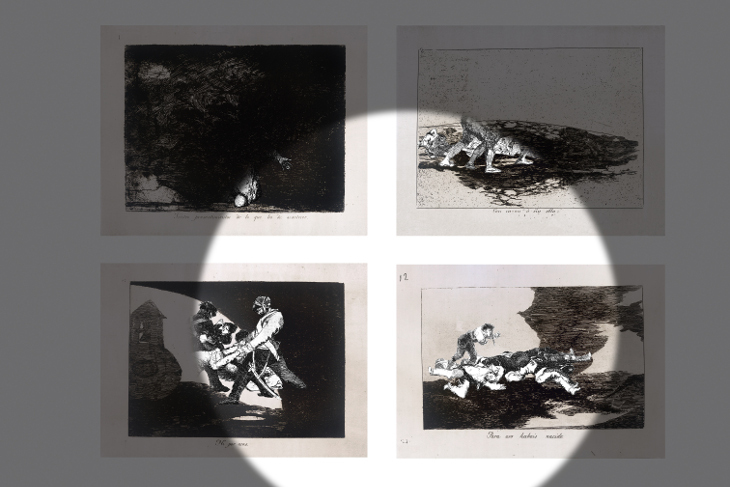 The result is a dialogue that reveals the ongoing relevance of Goya’s message two centuries later. The special loan of this installation falls within the Museum’s “Invited Work” programme, which is sponsored by the Fundación Amigos del Museo del Prado. Since 2010 this programme has enriched a visit to the Museum by establishing terms of comparison that allow for a reflection on the works in the Prado’s own collection. The Museo del Prado and the Fundación Amigos del Museo del Prado is presenting in Room 66 of the Villanueva Building the work When I count, there are only you…but when I look, there is only a shadow (2013), the last to be created by the Iranian artist Farideh Lashai before her death. This is a video installation which takes up Goya’s message and reinterprets it from the viewpoint of the present. It is inspired by his print series The Disasters of War, a universal symbol of suffering caused by human beings, of injustice and of the senseless nature of war. Farideh’s work encourages viewers to focus on the harsh, disturbing images in these prints and to feel involved in them. In order to achieve this the artist carefully manipulated each print, extracting the scenes and filling in the gaps left by the figures. The backgrounds thus become empty settings which she arranged in a rectangle comprising eight superimposed lines of ten photo-intaglio prints each. The previously digitally animated figures are projected over each of these backdrops by a small spotlight that passes across the prints to the rhythm of a Chopin Nocturne. When the spotlight coincides with a specific backdrop it projects the corresponding scene on it, which is animated for a brief moment before disappearing again into the shadows as the spotlight continues on its random path, illuminating new “Disasters”. Farideh’s account is a fragmentary one, based on the sensations produced by seeing the scenes randomly illuminated. The result is to make the viewer focus both on the backgrounds and on what is happening. A work of apparently simple appearance but of enormous complexity, it takes its reference point from Goya’s series, which Farideh deconstructed and reconstructed in order to reinterpret a contemporary reality. The work’s carefully devised composition, which juxtaposes the horror of the scenes, the lyricism of the rhythm of the light and the soft, romantic music, has an open-ended, poetic title which emphasises its meaning, inspired by lines from T. S. Eliot’s poem The Wasteland (1922). When I look… can be related to the body of visual work created by Farideh Lashai in the last seven years of her life, when she was influenced by the literary language of the autobiography she wrote as a mature artist. This body of work takes the form of video installations in which painting, poetry, theatre, film, animation and sound combine in a natural manner, expanding their expressive powers and giving rise to a distinctive language of juxtapositions of layers of meaning and dialogues with creative figures from all historical periods. For this project, which is part of the PHotoEspaña festival, the Museo del Prado has collaborated with the British Museum, which has generously loaned this work and will also be making it the principal focus of an exhibition in London in 2018. The Prado has also counted on the collaboration of the Fine Arts Museum in Ghent, which presented Farideh’s installation between February and early May this year using an approach that differed from the present one based on a dialogue with Goya. Lashai revived and updated Goya’s message in The Disasters of War in her aim of ensuring that his images do not succumb to the oblivion or indifference of the modern age. Despite their very different lives there are some striking parallels between the two artists. Goya conceived the Disasters in Spain in the second decade of the 19th century and Lashai devised her interpretation in Iran in the second decade of the 21st century. Both experienced fratricidal wars and occupation: the Napoleonic invasion (1808-14) and the Iran-Iraq war (1980-88). Both witnessed the horrors of war, the subsequent oppression and the causes that gave rise to it, and both were affected by the suffering of anonymous, innocent victims. Both were receptive to the ideas of their time through their friendships with contemporary artists and intellectuals. The theatre had a decisive influence on the two artists, who suffered illnesses in later life that produced profound introspection. Finally, through their resolute spirit of independence, both artists set out to denounce and offer an account of reality in its harshest form with the hope of encouraging viewers to ask questions, leaving us with only our own judgment. The display of Lashai’s work in the Prado, opposite a selection of prints from The Disasters of War and between the galleries that house The 3rd of May and the Black Paintings, means that the exhibition expands to incorporate these masterpieces of painting. The result is a unified whole which encompasses the same chronological and conceptual span as Goya’s prints and continues up to 1823, the year when he concluded the Black Paintings. As such it allows this dialogue with Goya, initiated by Farideh Lashai just before her death, to be intensified. Farideh Lashai (Rasht, 1944 – Teheran, 2013) is one of Iran’s most important contemporary artists. Since her childhood she worked in painting, glass carving and calligraphy and in the last years of her life created video installations that offer a natural fusion of painting, poetry, theatre, film, animation and sound. In Lashai’s complex and delicate work the poetic subtlety of the Persian tradition establishes a dialogue with accounts of the past, an acute sensitivity towards natural phenomena and a focus on the social and political conditions of her day. This counterbalance or duality of realities was a constant feature of her work. Linked to the revolutionary student movements of the 1960s and 1970s in Germany and Iran and to intellectual circles, Lashai was imprisoned in Qasr (1974-76). She witnessed the Iranian revolution of 1979 and the Iran-Iraq war (1980-88). Exiled in the United States between 1981 and 1984, on her return she lived through the bombing of Teheran in 1986. In 1990 she developed the serious illness from which she died in 2013. The exhibition is accompanied by a publication that includes four essays: I have guarded everything within me by Ana Martínez de Aguilar; Only a shadow by Venetia Porter; Farideh Lashai: more moonlight by Catherine de Zegher; and The unpardonable offence of war by Roberto Toscano. In addition, this June and in conjunction with the exhibition Ediciones Oriente y del Mediterráneo will be publishing The Jackal arrived, Farideh Lashai’s autobiography which has been directly translated from Farsi by Maryam Esmailpour. This new translation is sponsored by the Fundación Amigos del Museo del Prado with the collaboration of the Museo del Prado.